Jesus Christ reveals Himself to the church at Ephesus as the one “who holds the seven stars in his right hand and who walks in the midst of the seven golden lamp stands” Rev 2:1 (NIV). This is a reference back to Rev. 1 where we see Christ walking among the lamp stands, holding the seven stars in the palm of His hand ( which represents the seven Churches).Due to the persecution that the church at Ephesus was facing, they needed the reassurance that God was in control and also that Jesus was in their midst, that He held them in His hand. I know your works appears in each of the letters to the seven churches as a statement of recognition from the omniscient, omnipresent judge. In other words, God knows everything about us-our actions, thoughts, desires, works, hardships, perseverance, and faithfulness e.t.c. Do you ever feel discouraged? Do you ever feel like no one knows what you are going through? Do you ever feel like no one cares? Do you ever feel like you are doing a lot of work and no one appreciates the work you are doing? Jesus, says “ I know your works”. Jesus sees what you are doing and he appreciates you. Jesus cares about you. Jesus pointed out areas where the Ephesians church was weak. Areas they need to improve upon and focus on. The greatest commandment is to “love the Lord your God”. (Matthew 22:37.38). Leaving the first love means a great diminishing of the churches’ initial love, or a turning away from the love of God. Evangelical Christianity has lost this perspective on the Christian life. Most Christians have the idea that the Christian life is about how much God loves them and wants to fulfill their dreams, desires, ambitions, goals and objectives. About how he wants to make something wonderful out of them, elevate them and fulfill all the hopes of their heart. They think it’s more about God loving them so much that he wants to do all of this than it is about them loving him. But in reality, the Christian life is about loving Christ. It’s about loving him singularly and totally. It is about loving him sacrificially and obediently. It’s about loving him worshipfully and serving him. It’s really about loving Jesus Christ. That’s what it means to be a Christian. Your life is now committed to loving him. In the Old Testament, the great commandment was to love the Lord, your God, with all your heart, soul, mind and strength. This is the sum of all that God requires, and your neighbour as yourself. But it starts with loving God with all your heart, soul, mind and strength, which is just a way of saying loving God comprehensively, totally, completely. If that’s the sum of the law, then that has to also be the sum of the relationship. That can’t be altered when it comes to being a Christian. It is still the purpose of God that we would love the Lord, Jesus Christ, with all our heart, soul, mind and strength. Being a Christian is about loving Christ so much that you want to know him, so much that you want to exalt him, please him, serve him, be with him, and tell others about him. It’s about this overwhelming, consuming affection for Christ. This is the core of what it means to be a Christian. The real question to ask people, when you talk about their spiritual growth, or their spiritual condition, or where they are in terms of their life, is how much do they love Jesus Christ? How much do you love Christ? Are you growing in your love for Christ? Do you love him more now than you have in the past? Do you desire him more now than you did in the past? Paul says that, “I may know him.” He was driven to know more about Christ. To know everything he could know about Christ. To understand every word he said, every deed he did, the fullness of his purposes, his redemption. To understand the mind of Christ completely. To know how he thought about everything. Paul was driven to serve him, to exalt him, to honour him, to proclaim him, because he loved him. This is consistent with the Biblical definition of what it means to be a Christian. It is to love Christ. 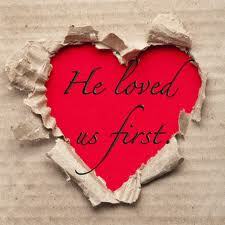 To love him as the one who first loved us and gave himself for us. It wasn’t that the church at Ephesus had stopped loving God or each other, but the love just wasn’t the same as before. This isn’t unique to the Ephesians church, we do the same too. When we first married our spouse, our love was passionate, hot and exciting but when kids came along, when we had financial challenges or when we got used to being with our spouse and perhaps took them for granted, the love diminished immensely. We don’t express our love to our spouse the way we used to anymore, we had forsaken our first love and allowed it to become dry and boring. This isn’t good for our relationship with our spouse and it is not also good for our relationship with God. Just like in the case with our marriage to our spouse, when our love isn’t as passionate and exciting as when we first got married, we need to reminisce it a bit. So also we need to do the same thing with our marriage to God. We need to remember what it was like when we first got saved and spent time in his presence. We need to go back to our first love.